Earlier this week I had the great pleasure of meeting world-reknowned composer Morten Lauridsen. He came to KU last Monday (3-06-06) and departed Wednesday morning. While he was here, he met with students, rehearsed with ensembles, hosted discussions, and attended a choral concert that we put together of his music. However, my favorite part was having dinner with him before the concert, along with Dan Forrest and his wife. All five of us had a private booth together, and we had a delightful time dining and chatting with him. Click the picture to enlarge it. 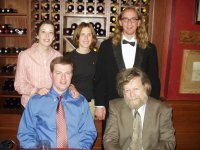 (Back row: Addy, Katrina, myself – Front row: Dan, Lauridsen) If I seem overdressed, it’s because I was singing in the concert right after dinner. It’s very enlightening to have a close encounter with a living composer of this magnitude. What are things that he had to say? First of all, he hates leafblowers. There’s nothing that can quite ruin the compositional process like some jacka jerk firing up the multi-horsepower noise machine in order to lay waste to a few dead leaves. During summers, he likes to get out of Los Angeles and head to a cabin on a remote island off the Washington coast. There, he communes with nature, reads, talks with people, and composes. There’s no television, traffic, or leafblowers to ruin the peacefulness. He also loves poetry, and reads it everyday. Before every theory class that he teaches, he reads a poem. Every day for roughly the past ten years, he reads a poem to a friend and has one read to him in return. The most humorous thing that he said was in reference to Eric Whitacre. At his 60th birthday “recital” at USC, Whitacre came up to him and said, “Dr. Lauridsen, you are my favorite composer to steal from!” I knew it! All-in-all, I had a great time meeting him, and just for him, I’ll be certain to never buy a leafblower. Originally posted on 16 March 2006.